Steve_Boudreaux's review"Replace The Pickups, And This Guitar Is As Good As A Les Paul Gets- Bar NONE"
tjon901's review"Official Les Paul copy"
Epiphone is Gibsons lower price line of guitar. They have pretty much the same specs as the Gibson models. The electronics are not as good but they are made from the species of wood but the wood may not be the best quality. The Les Paul standard guitar was introduced in 1958. They came with the first PAF pickups and when people talk about the Gibson tone they are talking about these. They have the standard Les Paul setup with mahogany body with a maple top and a mahogany neck with a 22 fret rosewood fretboard. Two humbucking Alnico Classic pickups with dual volume and tone controls with a 3 way toggle switch pickup selector. The up position on the switch selects the neck pickup. The middle position on the pickup selector selects both pickups. And the down position on the pickup selector selects the bridge pickup. It has a tune-o-matic bridge and stop tail piece. The Epiphone Les Paul standard has all of the same advantages and disadvantages in playability that every Les Paul has. If you are use to modern guitars with thin necks the Les Paul neck will be very big for you. Because of the set neck design there is a large neck tenon and joint. This can make the upper frets hard for some people to reach because the body essentially joins the neck at the 17th fret. After the 17th fret you are reaching around the body to get to the frets. The tuning stability is good because there is no tremolo. The quality of hardware Epiphone uses is not that great. I have had problems with the input jack unscrewing itself and things like that. The pickups Epiphone uses are not that great. They are pretty muddy and dead. You do not get much attack with these pickups. Since these pickups do not have much definition the neck position can get really muddy. These guitars are chambered like the Gibson Les Paul standard guitars. This takes away some of the thickness from the tone. With a high gain amp the sound might get muddy due to the lack of definition. With some types of music these pickups are great. If you want a bluesy sound these pickups will do really good and you will be able to get a smooth tone out of them. With a pickup swap this guitar can sound great so I would recommend to anyone who has one of these Epiphones to try it out with some after market pickups. If you are looking for a cheap Gibson Les Paul alternative there are better guitars out there. Epiphone makes the only official Les Paul copies but there are some other copies that are of a lot better quality. I would recommend looking at an Agile Les Paul copy. You can get a guitar half the price of the Epiphone but with better quality, and for the price you pay for this Epiphone you can get an Agile with an ebony fretboard and Gibson quality hardware. The Epiphone Les Paul Standard is a nice take on the classic LP guitar, under the Epiphone name and aimed at those who might not be able to afford a Gibson Les Paul. It’s got all of the same features and make up that you’ll find on a Gibson Les Paul Standard, but it’s made of lesser parts and I don’t believe it’s made in America. The guitar has dual humbucker pick ups, each with their own independent volume and tone controls and a three way selector switch for choosing between the pick ups or blending the two of them together. This is a pretty standard electric guitar configuration, which the Les Paul has impacted no doubt. I don’t really know what kinds of woods this guitar is made out of, but it doesn’t feel incredibly cheap unless you compare it directly to a Gibson LP. Playing the Epiphone Les Paul Standard is no trouble at all. The neck is pretty round as you’ll find with most Les Pauls, although I can’t say that this one feels as fluid as a Gibson Les Paul in my opinion. Controlling your sound with the pick ups is really easy, as anyone who has ever had an electric guitar should be able to use this no problem. I don’t think that a manual is necessary for this guitar, although I haven’t seen one myself. The Epiphone Les Paul Standard absolutely has the sound of a true Les Paul. I haven’t had a chance to shoot out this guitar and a Gibson Les Paul, as it’s been a while since I’ve played this guitar. A friend of mine that I grew up playing up with has this guitar, so it was always around and I was always playing it, but never really did any recording with it. It’s certainly going to give you that creamy Les Paul sound, which anyone who has ever used one before will tell you works incredibly well for both rhythm and lead parts. I’d be curious to see how the sound of this stacked up against a Gibson Les Paul Standard, but from what I can tell it’s going to be closer than you think. The Epiphone Les Paul Standard is a great way for beginning and intermediate guitar players to get a great axe at a great price. If you’ve only been playing a short while and are looking for a guitar to bring you up a notch without having to spend the money it would take to get a full on Gibson, the Epiphone Les Paul Standard is the perfect guitar. While some will say that this is cheaply made and all that, which I guess it is compared to the Gibson version, this is no doubt a bona fide electric guitar. MGR/Voxguitarist30's review"Epiphone Les Paul Standard Quilted Top"
Doherty's's review (This content has been automatically translated from French)" toutoute first time!" standard model studio sunburst but I've never found one that had a name like that. sound pickups and pots condo block is not terrible, but the time has come to make a small change with gibson knobs 59, bubble bee capacitors and DiMarzio paf 36 th anniversary, I think not take risk to say it 'll waltz in the cottages! tarz200tdi's review (This content has been automatically translated from French)" A quality instrument, a good base for upgrades"
A one detail: mine was not a Korean, but part of this series, branded "limited edition" behind the head (not made in Korea), built in czechoslovakia with European woods, and finished Nashville. A Standard Cherry Red like no other what .. It has a side "real Les Paul" considerable weight, perfect finish, a round handle enough for me but very comfortable, and sustain madness ... even empty! I was impressed by the ability of the guitar to transmit the vibrations of the strings, and lonnnnnnnnnngtemps after playing the note. small defect, but present in all the shovels that I have had in my possession: a hard nut to cut, so a holding agreement not always terrible ... Again, no need to change the original mechanical KLUSON are very good: a shot of lime in the luthier, a little pencil in the grooves fat recut the nut, and roll! Actually I regret a little, and I would not back against a model of the same series, which is well above the Epiphone Les Paul standard. If you come across one, to the coast, do not miss! Mine dates back to 2000 and was made in Samick in Korea. The handle is comfortable and is also a 1959 Slim. The original sound is not bad, the microphone is even more serious good treble a bit garish in contrast. They lack a little precision but do the job. With proper wiring it gains enormously in character for a very reasonable sum. I think it's really to make the upgrade, after determining the type of sound to which you want to go (vintage or modern). The change in micro helped me refine the grain and make a little more precision and finesse. I currently play in a Tech21 Blonde, between the two with a Proco Rat (sometimes) or a Maxon OD808 (often). Turning down the volume are also obtained beautiful clean tones that are used to address registers coolest. Please note that notice, like that of Obiwan76, for older models made in Korea, it seems that the current Chinese model quality is not really comparable. vicinity27's review (This content has been automatically translated from French)" not even afraid of Gibson!" thick handle for good grip, at least it feels like the guitar. Micro Alnico (yes the original). Asian manufacturing but not présicée. Weight impec you can play with for hours. Perfect position, the extension of the body. In disto's okay nothing fantastic, she throws for 300 euros! 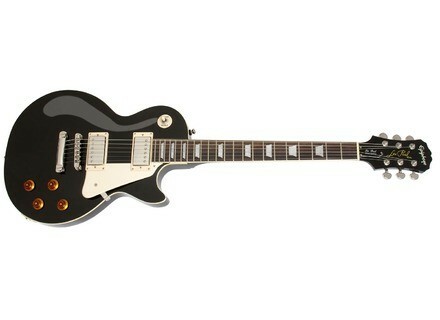 Over time I'll end up letting go for a gibson which costs eight times more expensive anyway ... and its not an 8 times, but hey "Only Gibson Is Good Enough"
sam66's review (This content has been automatically translated from French)" Epiphone Les Paul model? the right choice!" cons by the weight of good shall be identical shoulders! weight form is an acute lespaul therefore access to a fair bit but know where you're going with this kind of guitars! after changing the microphone sound is to go and found the benefits of a heavy body that has good sustain with nice overtones a good balance of all frequencies are in! Good with these micro jazz is not good on the other hand rock blues hard rock neo metal is plenty to do! I play on marshall jvm 410 and finally I can get a clear sound, with a transistor amp was too powerful microphones and sound saturated Desuite! there with no problem beautiful lamps found the personality of the guitar in tt modes clean distortion crunch and more! Perfect for rock style Deep Purple Led Zeppelin AC / DC etc. by microphones that are my top is versatile but in some areas the not amuse myself by playing country music with the microphone on it (it's on !). 2 years ago I wanted after a large flow of money to pay me a real lespaul made and I was disappointed by the prices and the models they offered tt (try more than 8 lespaul different landforms of 1959 to 2008 models!) certainly sounds typical varnish the wood were all very well but at the end of it with my Epiphone a15 years I really have a good instrument that cost me much much cheaper and with two three modif tt is made to my expectation this would be a shame to buy a guitar at 2000 € and change the pickups Desuite as possible and there's not kill the budget! value for money is excellent for me and if it was to do again I would do this purchase the difference is not obvious with the "true" to the final! and the shield that I turned Desuite! guiaumguiaum's review (This content has been automatically translated from French)" Trs good guitar for rock"
I had the bad luck that the microphone m ds ttaient make feedback that would put the gain of the distortion, even the kids. I did not notice when I bought it for testing on an amp that I do not know. I replaced the microphone by EMG 60 and 81. Now she has a pure sound, but you must love the sound of heavy distortion EMG. I will have more buying di Marzio versatile, but I do not regret my purchase because I now availing oneself of a good guitar with a typical sound.